Please take a couple of minutes to listen to this TED talk. It is definitely worth it and needs no further comment from me. It is only 4 minutes long. Don’t wait to be a hero. Thank you to my friend Neil O’Hanley for sharing this with all of us. “A group of alumni, highly established in their careers, got together to visit their old college professor. Conversation soon turned to complaints about stress in work and life. Offering his guests coffee, the professor went to the kitchen and returned with a large pot of coffee and an assortment of cups: Porcelain, plastic, glass, crystal. Some plain looking, some expensive, some exquisite. He told his guests to help themselves to coffee. “If you noticed all of the nice looking, expensive cups have been taken up, leaving behind the plain and cheap ones. While it is normal to want only the best for ourselves, that is the source of your problems and stress. Be assured that the cup adds no quality to the coffee. In most cases it’s just more expensive, and in some cases even hides what we drink. What all of you wanted was coffee, not the cup. But you consciously went for the best cups and then you began eyeing each others cups. 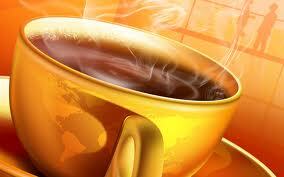 Now consider this…Life is the Coffee….the jobs, the money and the positions in society are the cups. They are just tools to hold and contain LIFE. And the type of cup we have does not define, nor change the quality of life we have. Live simply. Speak kindly. Care deeply. Love generously. Thank you to my friend Gene Choin for sharing this nice thought. A little more than 30 years ago, I lived in the exact spot of the recent Japanese earthquake epicenter where the villages were leveled, life was lost, livelihoods were destroyed, and a thousand years of farming was wiped away within seconds by crashing timbers, twisted earth and raging waters. Our home was right on the ocean and I have pictures of my carefree little girl walking down the picturesque pathway to the beach. I am certain it is all gone. I am deeply saddened by the horror I have seen on TV. . . places where I walked and shopped, celebrated the cherry blossom festivals and went to the hairdresser . . . all now completely unrecognizable. The little store with the friendly shopkeeper who swept the sidewalk endlessly, the restaurant where we went for eel, memories of my dear house keeper who put my leather shoes and cashmere sweaters in the washing machine and dryer, her darling little grandson who had the reddest cheeks I have ever seen, the obachans (grandmothers) whose backs were permanently bent from years of sweeping the pine needles in our village (and who always had candy for my two year old daughter), my blind acupuncturist, his family and all of his patients with whom I spent many hours every week sharing our thoughts, wants, needs, fears, hopes and dreams with my very limited Japanese at the mercy of their generous understanding, abundant patience and senses of humor. All were so eager to learn about this American woman and her unusual ways and I was so interested in learning about them, and we became friends. The effort we put into communicating was heroic and I am now ever so grateful that we all took those fleeting moments together and made them meaningful. So many of the people in the area were simple, hard working farmers who tended the rice paddies that had been passed down for many, many generations, and although I pray they escaped unharmed, I am sure many must have been caught and lost in the devastation and it truly hurts my heart. They were such beautiful people, so curious, so generous, so lovely, so simple, so sweet. The horror of those 30 seconds, when their entire world changed, is very difficult to comprehend. I am thankful for the fleeting moments we shared those many years ago and I will treasure them in my heart forever. Please give to them with generosity and love and hold them in your prayers. . .
Here’s a little worksheet for you. Take a few minutes to fill it out. It may show you how to better deal with a difficult problem/person in your life. You cannot get to peace and effective results from this place! Whatever you resist, persists. It is a law of the universe. Things are how they are, People are how they are. As soon as you accept that, you can then be a source of influence to change it. Don’t get into a fight with the people and circumstances in your life. You may win the battle, but you will lose the war. Life will not be pleasant or happy or fulfilling for you or anyone around you. Accept that it is how it is, s/he is how s/he is. Like it, don’t like it, it doesn’t matter. The universe doesn’t care. Let go. Be like water. Go with the flow. Stop trying to change the things/people outside yourself and look within at how YOU can creatively respond/react differently to achieve the results you’re looking for.